President's Message: When Measurements Matter . 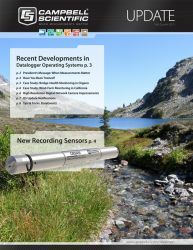 . .
We show you in this issue of the newsletter how we continually release new operating systems (OSs) for our dataloggers and other products, and how the new OSs improve product capabilities. Of course, you can’t take advantage of a new OS unless you know it exists. A Customer Center account on our website can help you stay in-the-know. With an account, you can sign up to receive an email whenever we release a new OS that you are interested in. You’ll find other helpful resources there, as well. Right now, Customer Center accounts are available to current customers of Campbell Scientific. We hope to add broader access in the future. If you haven’t taken the opportunity to register, we encourage you to do so. If you would like to register for an account, please visit our registration page at www.campbellsci.com/register.